Happy 2014! | Turning my world upside down! 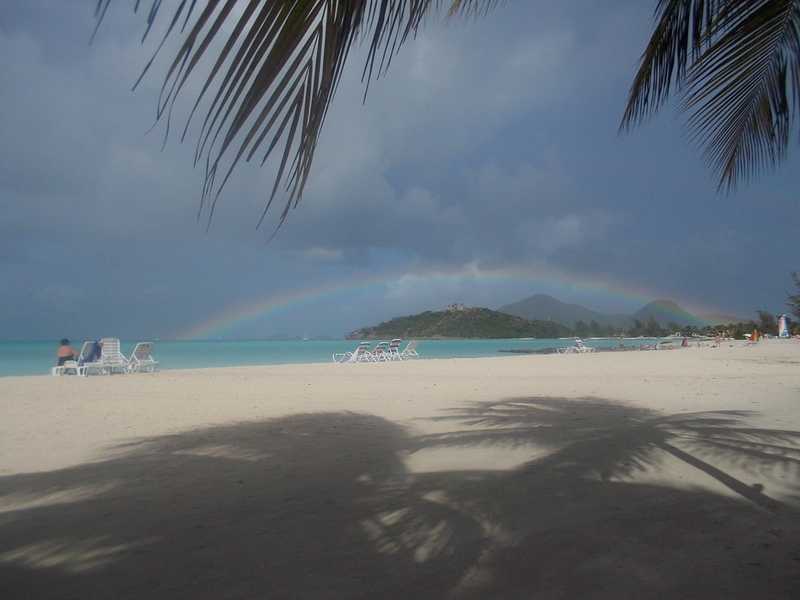 There was often a rainbow after a rain shower. It’s the new year already and we are spending the first days of it in Antigua, a lovely island in the Caribbean, about as far south as Nicaragua. The hallmark of this trip is probably the colour of the ocean, a milky turquoise. 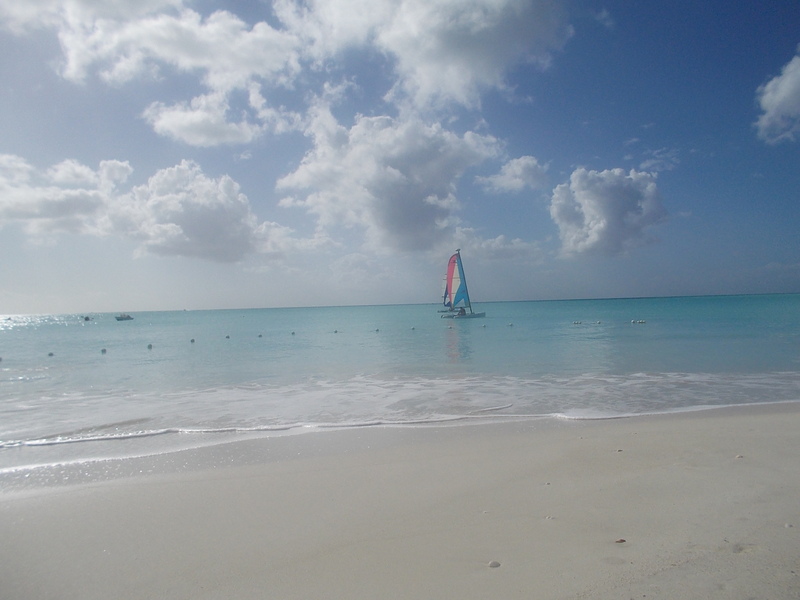 The weather is generally sunny with sudden very short rain showers that happen at the most inopportune time like when we are out on a Hobie Cat or when a bride is about to enter the wedding gazebo which is at the opposite side of the main pool. The week started off with a bit of a mix up at the stay and fly hotel. Tripcentral has given me a $100 gift card to use towards parking or stay over hotels. Unfortunately, our hotel in Montreal didn’t seem to know anything about this arrangement. I made a call once at the airport and it was all sorted out quickly. Then there was a 2 hour delay while our plane had some mechanical repairs done. Hey, when your plane needs fixing, you’d rather put up with the delay that the alternative, right? The flight was uneventful, champagne was served, Leon watched a movie while I read. We landed after dark so we could only see the lights of the island but as we disembarked, I sure enjoyed the sight of the tall palms and the hot moist night air hitting me. 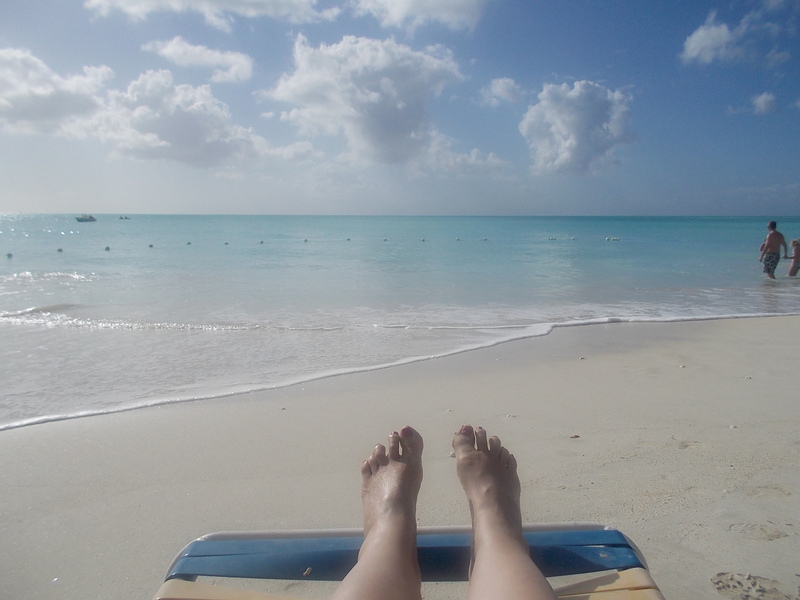 Ahhhhh, Antigua…. Leon trying to relax on day 1. We checked in to our hotel and had time for a very late dinner at the main buffet. The hotel was older, as expected, but the beach was long and lovely. The staff was friendly and helpful, in spite of an overfilled hotel with serious plumbing issues. So our toilet didn’t always work, no biggie! We managed just fine and the staff kept the champagne flowing, much to my delight. Day one, we booked our tours for the week and a la carte restaurants, which were the Italian restaurant and the seafood restaurant on the beach. We spent the day walking on the beach, looking at the private residences that were available for sale or rent, trying to stay out of the showers by ducking under the many sun shelters that dotted the beach and generally trying to unwind. Good start. You never get tired of the colour of the ocean. Day three, New Year’s Eve, we were supposed to go on a jeep tour of the island but I was suffering with my usual post-Christmas stomach problems so we cancelled those plans. I heard at lunch the next day that the roads were very bumpy, so my hip would probably not have enjoyed that trip as much as the boat ride. We took it easy and prepared for a nice dinner and a very colourful musical show, complete with staff members in jungle animal costumes like a peacock, a cheetah and what looked like a figurative lion. We got all dressed up and had some great pictures, but unfortunately, the tech gremlins ate a whole group of pictures as Leon was transferring them to the computer. But believe me, it was a very nice evening! There were lots of weddings in the gazebo that day and I recognized one bride at dinner along with her husband and family. I went over to congratulate them and told her about my secret weapon to guarantee all kinds of privileges at airports, including free champagne; all she has to do is carry her bouquet with her on her trip home so everyone knows she is a newlywed. It worked for me, anyway! The evening was particularly rainy with several showers punctuating our dinner. We were seated outside under a sun umbrella that seemed to drip excessively at times. But the area was filled with more and more guests wanting to get a good view of the show, so chairs were at a premium. We were not about to move from our spot for any reason. So we sat, mostly dry, and enjoyed the evening, meeting some of the other guests as they would stop by our table for shelter throughout the evening. I wonder what the people up north are doing? Looks like the place for me! I am glad you enjoyed my post. I see from your blog we have much in common. Enjoy your sabbatical. My next trip is Casablanca and Barcelona in March to celebrate my daughter’s graduation. Casablanca and Barcelona will be fabulous places to visit! How exciting! Having a very mild winter here on the French Riviera! Groan…. Just a couple more years and I will be able to winter wherever I want. Freezing! That’s what we are doing up North! Our departure for Key West, Florida is for next Thursday. That will be our home until spring. 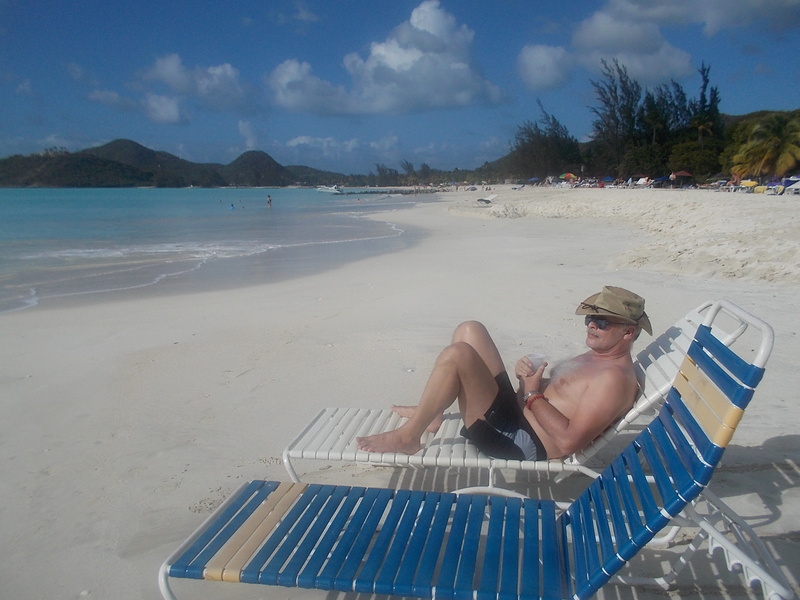 It’s good to see that “life is also good in Antigua!” Leon looks very comfortable on that silky sandy beach! You devils! I wish we could be in Key West for the next 3 months until the snow is gone up here. Have a great winter!